“For more than six years my family has been consistently harassed by our neighbor Nico Dauphine… My wife and our children are fond of our pet cat. We have never owned more than two at a time, however we have been twice charged with a violation of the Athens leash law for our cat wandering into Nico’s yard. It was peculiar that when I requested to be shown the legal violation, that Patrick [Rives], Nico’s boyfriend, and head of animal control, handed a copy of the dog leash law with the word “dog” crossed out and “cat” hand-written in. This indicates to me that there is no specific violation concerning wandering licensed pet cats. Regardless, this household was fined twice, $80 on one occasion in 2008 or 09… and once for $50 in 2010… Additional circumstances involved in these cases would in most circumstances be considered legal entrapment, as Nico baited traps in her backyard with very aromatic bait to attract cats, then would take the cats away and drop them where they would be killed in traffic, as the local shelter would no longer accept cats. On no occasion did Nico ever inform me that she had caught my cat. As a good neighbor I, on several occasions, asked Nico to alert us when our pet had wandered into her yard. I even suggested that she spray them with a garden hose to encourage them to stay away from her yard. Our children, who were six and eight years old at the time, had to give up their pet, which they had cared for since it was a very small kitten, as he (Jake) would get out and hide in the overgrown brush lot that is Nico’s yard. The children were heartbroken and have as a result learned to hate Nico, which is a behavior we try to minimize in our children. My pet Siamese, who I had owned for more than six years, was a trained companion animal, as I am totally blind. My cat Lily was trained to pick up dropped items for me, warn me of obstacles in my path in the house, and alert me to people at the door. Nico trapped Lily once in a trap, without any water, on a weekend when Nico had been away in Florida for at least three days. I rescued Lily on that occasion, and threw the trap cage back across the fence into Nico’s yard. In the spring of 2010, Lily got out of my house. As she is chipped, I began calling all the shelters after she was missing for a full day. It was later reported back to me that Nico had told some neighbors that she had gotten rid of that cat. The distress and emotional drain of that incident continue to be costly to me. I had to withdraw from my PhD program as a result, where I was at the point of beginning data collection. Isn’t this the same Nico Dauphine whose attorney, following her arrest in May, told the press that Dauphine’s “whole life is devoted to the care and welfare of animals”? The same Nico Dauphine who landed a prestigious position with the Smithsonian Migratory Bird Center (part of the National Zoo), working alongside Peter Marra, conducting research “on [citizen participants’] free-roaming pet domestic cats”? And the same Nico Dauphine who was invited earlier this year by The Wildlife Professional to contribute to a special section of their Spring issue, “The Impacts of Free-roaming Cats” (in which Dauphine gives readers the ultimatum: “Pick One: Outdoor Cats or Conservation”)? Of course. It’s also the same Nico Daupine who’s scheduled to appear in court October 24th, charged with attempted animal cruelty related to the poisoning of cats in her Washington, DC neighborhood. Note: Patrick Rives did not respond to my e-mail request for comments about this story. My sincere thanks to Animal Wise Radio hosts Mike Fry and Beth Nelson for having me back on the show—this time to discuss the recent arrest of National Zoo researcher Nico Dauphine on charges of attempted animal cruelty and the Smithsonian’s subsequent reaction. If you missed it, you can check out the complete show in podcast format at iTunes. Also, an MP3 file (22 MB) of our conversation about Nico Dauphine and the Smithsonian (approximately 22 minutes) is available here. Although Nico Dauphine has yet to be suspended from her duties at the Smithsonian’s Migratory Bird Center, it seems all the attention she’s received over the past week-and-a-half is making life rather uncomfortable for her supporters. Last week, the National Zoo removed Dauphine’s online application for recruiting field assistants from its Website; this week, the University of Georgia’s Warnell School of Forestry and Natural Resources pulled her infamous “Apocalypse Meow” presentation from its site. Dauphine (whose status hearing, originally scheduled for June 1, has been postponed until the 15th) presented “Apocalypse Meow: Free-ranging Cats and the Destruction of American Wildlife” in March of 2009, at Warnell (where she earned her PhD). Although she tells the audience that her goal “is to review and present the best available science that we have,” what she delivers is essentially no different from what she presented in her Partners In Flight conference paper  (much of which is recycled in the current issue of The Wildlife Professional in a special section called “The Impact of Free Ranging Cats” ). In other words: lots of exaggerated and misleading claims—and plenty of glaring omissions (i.e., the distinction between compensatory and additive predation). 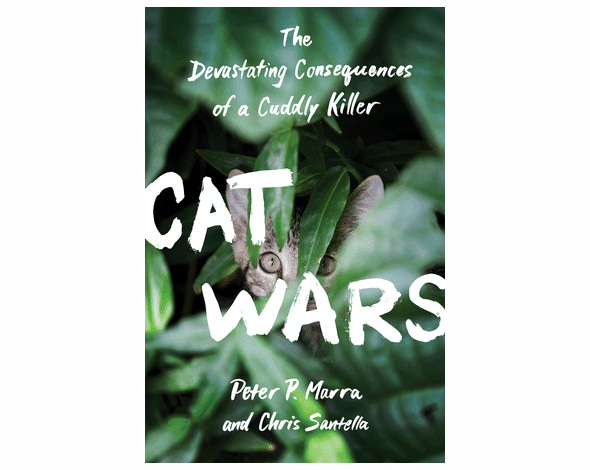 Included in the section on predation are all the usual suspects: Longcore et al.,  Coleman and Temple,  Crooks and Soulé,  PhD dissertations by both Christopher Lepczyk  and Cole Hawkins,  along with references to Linda Winter, David Jessup,  Pamela Jo Hatley, and others. Dauphine stretches Hawkins’ conclusions (which Hawkins himself had already stretched past the point of being defensible) to suggest “a sort of preferential prey take for native species in some cases, by cats.” In other words, the cats might target native species. Or not. Less than two minutes later, Dauphine’s making the case for hyperpredation—the devastating impact on native prey species (e.g., seabirds) brought about by a large population of cats supported largely by predation on an introduced prey species (e.g., rabbits). It’s difficult not to see Dauphine’s assertion that “it’s not productive to argue about the numbers”—which comes fairly early in her presentation—as disingenuous when she tries repeatedly to quantify predation levels (each of which is then qualified as “conservative”). 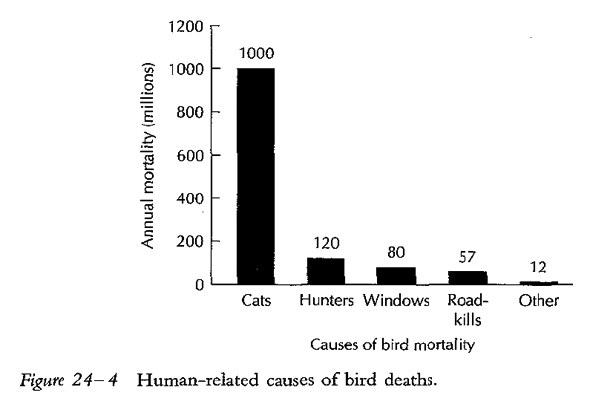 Her use of a graph included in the second edition of Frank Gill’s Ornithology (shown below) is particularly interesting. And where does Stallcup’s “data” come from? Some of these (maybe 10 percent) never go outside, and maybe another 10 percent are too old or too slow to catch anything. 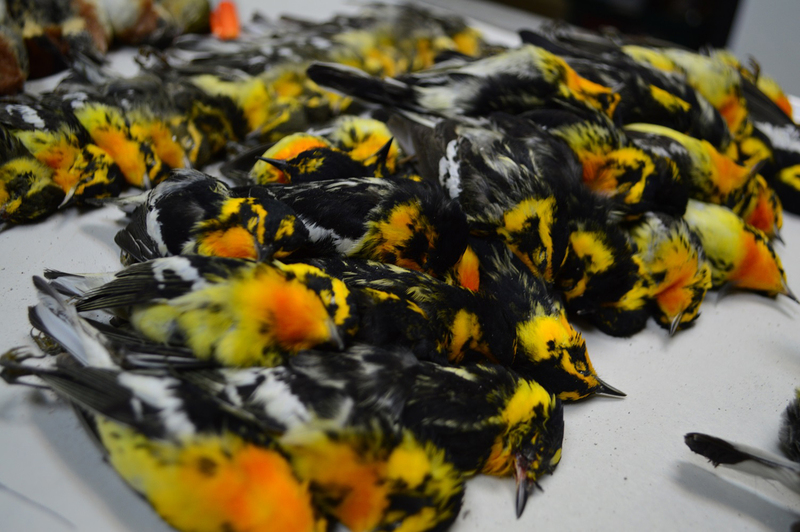 That leaves 44 million domestic cats hunting in gardens, marshes, fields, thickets, empty lots, and forests. Two years later, this is pretty much what Nico Dauphine stands accused of. 2. Dauphine, N. and Cooper, R.J., “Pick One: Outdoor Cats or Conservation.” The Wildlife Professional. 2011. 5(1): p. 50–56. 11. 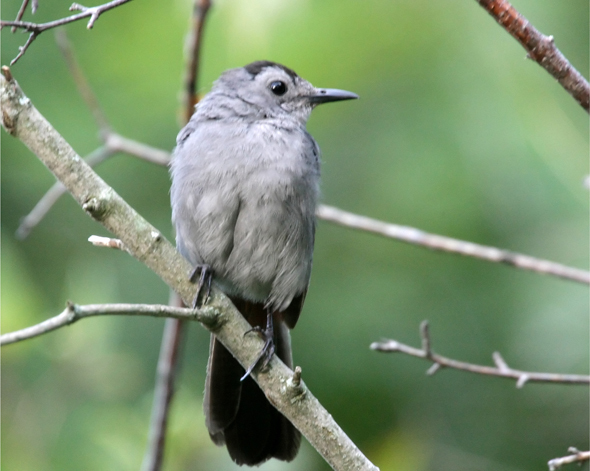 Gill, F.B., Ornithology. 2nd ed. 1995, New York: W.H. Freeman and Company. Tuesday, while animal welfare organizations across the country were issuing statements condemning the alleged cruelty and urging justice in the case, Nico Dauphine’s employer was expressing a rather remarkable lack of concern. Scott Giacoppo, Vice President External Affairs & Chief Programs Officer for the Washington Humane Society, questioned whether Dauphine should remain employed by the National Zoo in the event she’s convicted. “Alley Cat Rescue vehemently disagrees with keeping Dauphine in her current position at the National Zoo,” reads a statement posted on the organization’s blog. “[ACR] believes she should be removed until an investigation into these allegations of animal cruelty has been completed.” ACR has started a petition aimed at getting Dauphine removed. Meanwhile, a spokesperson for the National Zoo, which oversees the Smithsonian’s Migratory Bird Center—where Dauphine works with her advisor, Peter Marra—was trying to play down the fact that one of its researchers is charged with attempted animal cruelty. Which begs the question: Does Baker-Masson actually know what Dauphine’s research is? The predators, in this case, are (not surprisingly) house cats. And, according to an online application form (which mysteriously disappeared from the Smithsonian’s Website Tuesday) she’s been using to recruit field assistants, Dauphine is asking participants to put cameras on their cats—thus allowing her team to monitor the cats’ every move. Granted, Dauphine’s yet to have her day in court, but still—at this point, who in their right mind would allow their cat to participate in any study sponsored by the Migratory Bird Center.